Classy, elegant, in vogue, uptown are some adjectives that completely defines our own Bollywood style icon – Sonam Kapoor. She has always raised the standards of Bollywood to a completely different level, if not by her acting skills then by her fashion sense. We all know that she creates more headlines with her style statement rather than acting. She is one of those actress who believe in setting a trend rather than following a trend. 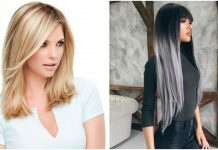 Her fearless attitude when it comes to trying out new styles has always been applauded. 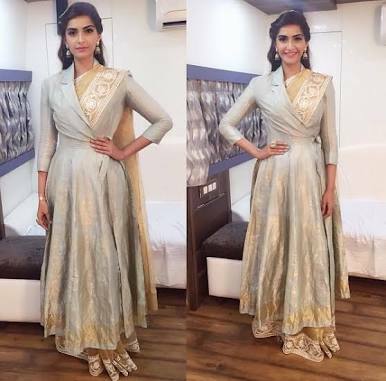 Sonam look angelic and chic in any outfit; traditional, gown, pant shirt or a casual tee, you name it and she just nails the look. She can be your desi girl, when in traditional and can pull off a hot western attire effortlessly when needed. Sonam Kapoor is never scared to try new make up looks, for best Sonam kapoor Make up Looks. Sonam Kapoor has managed to leave us awestruck whenever she has donned a Saree. It’s always a pleasure to see Sonam Kapoor in the nine yards, be it the blouse, the design or the way she carries it. It’s simply alluring to see how she wears a simple saree with a twist. Time and again, she has managed to blow away our mind by draping sarees in the most gorgeous way. So lets have a look at 20 times when our fashion diva donned the saree look with a “twist”. We can’t forget the dhoti style saree that she made popular and also became a style icon for all those who tried this different way of draping sarees. It was so much in rage that the internet was filled with videos and step – to – step illustrations on how to drape saree this way. Other bollywood actress in Saree. There have many actress who have tried this look but no one aced it like Sonam did. Even you can carry this look by adding a dupatta of the same hue or draping two sarees of the same shade seamlessly. Sonam Kapoor didn’t fail to impress her during the Republic Day ’15 when she donned a Abu Jani and Sandeep Khosla & Khadi saree. Though the saree was simple with just a border but what stood out was the Gujarat inspired multicolored embroidered blouse. What proved Sonam’s fearlessness when it comes to trying new styles is when she was seen draping a Saree not only made of fabric but also of molten wire mesh. The Cannes Film Festival has always been a favorite for Sonam when it comes to flaunting new styles. This saree definitely made the fashion icon the talk of the town. Sonam was seen wearing a white lacy saree with a stylish embellished blouse and this ensemble was given the picture perfect touch by a long white and golden jacket. This Anamika Kapoor attire earned her accolades at the Cannes Film Festival. Sonam wore the Suneet Verma saree at India gems Jewelry Fairy. The off shoulder blouse just complimented the saree and Sonam looked stunning in it. Though, she was walking the ramp to flaunt the neck-piece, but she gave a strong style statement. Jacket over a Saree? Seems unusual. But when it comes to Sonam, it’s usual to expect the unusual. This Rahul Mishra couture is difficult to pull off but she managed to pull it off effortlessly. Sonam was seen draping the Payal Singhal saree from her LFW Winter Fashion Collection on the talk show “Front Row with Anupama Chopra”. The saree was plain with a single shouldered blouse that had heavy floral embroidered pattern. Sonam burnt the stage with her multi border pink and black saree. The look was complete with a multi colored saree and a black blouse with a golden border. 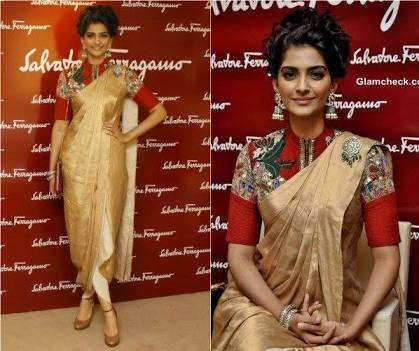 Sonam gave the Anamika Khanna outfit a new twist with dhoti drape and adorning it was a sheer cape. The embellished blouse which was covered with the cape matched with the border of the saree. Sonam preferred to keep minimal make up and accessorized the look with a choker and a matching clutch. Isn’t Chiffon Saree to boring and out of vogue? No it isn’t if you know how to style it with pearl body chain and bring in a twist. Sonam Kapoor was seen in a blue pastel chiffon saree suited with a three fourth sleeved blouse but what grabbed the attention was the pearl body chain jewelry over the pleats that gave it a royal touch. She accessorized the attire with kundan and pearl jewelry which gave it the perfect look. This look is one that only Sonam can dare to pull off so confidently. 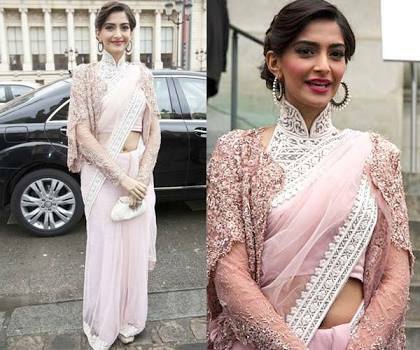 Sonam has draped the saree in such a manner that the laser cut blouse made of sheer fabric is visible giving it a trendy look. The saree is simple with a border but it is glamorized by the high neck buttoned blouse which matches the border of the saree. The saree is beautified with a shrug which gives it a vintage look. Sonam was seen draped in a Payal Pratap plain white saree. This surely shows her love for neutral colors. She accessorized the whole attire with an aqua colored Amrapali necklace which complimented the ensemble. 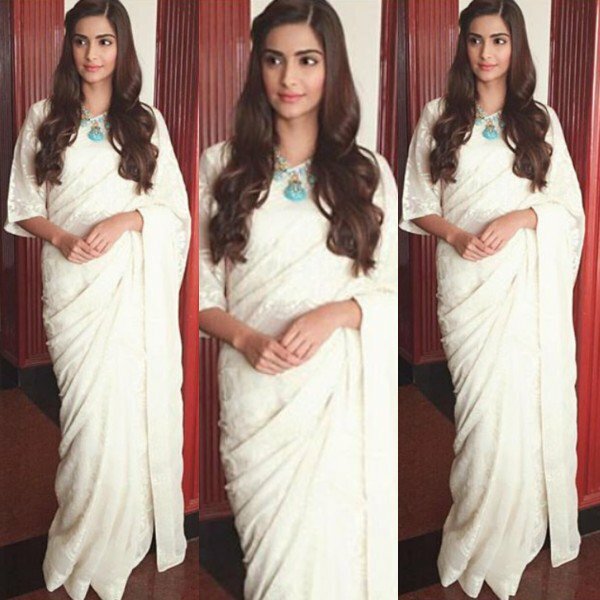 Sonam indeed to pull off the dhoti styled saree. Sonam chose a plain beige saree and dolled it up with a front zip embroidered blouse which gave it a modish look.